Classic shortbread cookies will never go out of style. The rich, buttery flavor and irresistible crumbly texture are incomparable. They are also very simple to make and lend themselves easily to variations. Matcha is Japanese green tea that is finely ground into a powder and used in the traditional Japanese tea ceremony. It is very concentrated in flavor and color, and you will probably have to mail-order it unless you have a well-stocked tea purveyor near you. Line 2 jelly-roll pans with parchment paper; set aside. Whisk the flour and salt together in a small bowl to aerate and combine; set aside. In the bowl of a stand mixer, beat the butter on medium-high speed with the flat paddle attachment until creamy, about 3 minutes. Add the matcha and beat until the mixture is a uniform green color and very creamy. Add the sugar gradually and continue beating on high speed until very light and fluffy. Turn the machine off, add about one third of the flour, then turn the machine on to low speed. Gradually add the remaining flour, mixing just until blended, scraping down the bowl once or twice. The mixture will look crumbly; if you squeeze it between your fingers, it will come together. Gather it together into a ball with your hands while it is still in the bowl. Roll out the dough to a ¼-inch thickness between two pieces of lightly floured parchment. Peel off the top parchment and cut the dough in half. Sprinkle the sanding sugar evenly over one half of the cookie dough and gently, with hardly any pressure, roll over it with a rolling pin to help it adhere. Using a 2-by-1-inch leaf-shaped cookie cutter, cut out as many cookies as possible from both doughs and place on the prepared pans 1 inch apart. Use the back of a sharp paring knife to make vein patterns on each cookie. Refrigerate for 1 hour or up to overnight, if desired. Position racks in the upper and lower third of the oven. Preheat the oven to 325 degrees. Bake for 17 to 22 minutes, or until the cookies are dry and firm to the touch; their color will not change. They should retain their shape if you try to pick one up and there should also be a fragrant butter and matcha scent emanating from the oven. Cool on the pans set on racks for a couple of minutes, and then carefully transfer the cookies to racks to cool completely. Store at room temperature for up to 2 weeks in an airtight container. As with all teas, there is a huge range of quality and prices. Ito En is a Japanese tea company that offers many matchas from which to choose. 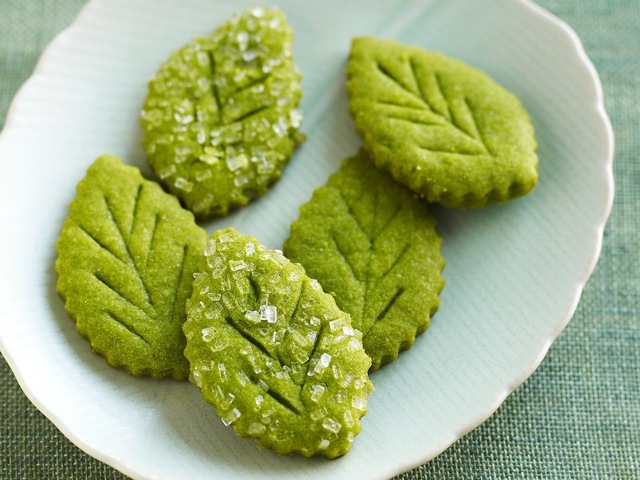 For baking, I like their Kiri No Ne matcha, which not only has a lovely color and flavor profile, but also happens to be less expensive than many. I suggest a range for the amount of the matcha; it has a distinct flavor that some might prefer on the nuanced side, in which case use the lesser amount. If you are a matcha fan, use the more generous proportion. The optional coarse sanding sugar can be sprinkled on half of the cookies; after baking, when both the sugared and plain cookies are arranged on a platter, it creates a nice contrast between sparkly and matte. The sugar can be ordered from Beryl’s. The leaf-shaped cookie cutter is a playful nod to that fact that these contain leaves — tea leaves. I used a “rose leaf” cookie cutter that is just shy of 2 inches long and 1 inch wide, which you can find at Beryl’s. You can certainly use a larger cookie cutter, or even a different shape, but the yield and baking times might change.